As our Blessed Mother stood before the Cross of her Son, she heard Him speak these words with compassion, conviction and mercy, “Father, forgive them, they know not what they do.” What would Mother Mary have thought as she heard her Son speak these words about those who were responsible for His brutal torture and death? What would she, as a mother, think about this prayer of her Son? These are the first of seven statements of our divine Lord spoken from the Cross. In many ways, they are foundational teachings for the entire Christian life. These words about forgiveness are integral to that foundation. As our Blessed Mother heard these words of her Son, she would have immediately echoed these sentiments spoken from the the heart of her Son. As Jesus cried out to the Father, begging for mercy upon those responsible for His brutal Crucifixion, so our Blessed Mother would have cried out as in one song of mercy and praise. Their hearts of mercy were united. One unwavering song of forgiveness was sung by two voices, He who suffered physically and she who suffered silently. To forgive without reserve in such a moment is almost beyond human comprehension. It’s beyond what our fallen human nature can immediately grasp. So often we want revenge and worldly justice. We want others to be held accountable and judged for their wrongs. But this is not our role. The Father in Heaven is the only judge. We have only the duty to forgive. And we must do so over and over again. Who has hurt you? Against whom do you hold a grudge? Whom have you failed to forgive? Forgiving another does not excuse their sin. On the contrary, an act of forgiveness acknowledges sin as a prior act in need of mercy. Forgiveness offers mercy even when it is not asked for or even deserved. Mercy must be given by us without reserve and in every situation in life on account of the unlimited mercy given to us by God. Mercy flows downhill. Reflect, today, upon the Mother of God seeing with her own eyes the most brutal treatment of her Son. 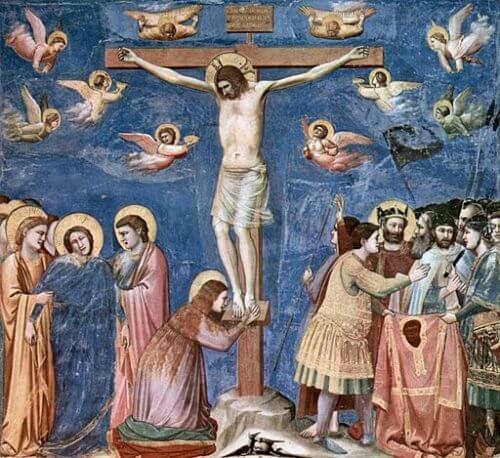 As you ponder her at the foot of the Cross, listen to Jesus speak those powerful words, “Father, forgive them, for they know not what they do.” Listen to those words with our Blessed Mother and know that she spoke them with her Son without reserve. Join in their prayer and offer it for those whom you need to forgive. My dearest Mother of Mercy, you listened in love to your Son speak these most incredible words, “Father, forgive them, for they know not what they do.” These words were like an arrow of mercy piercing your heart. And you responded to these words with your own prayer of mercy for all those who had sinned against your Son. My dear Mother, pray for me that I may imitate this prayer of forgiveness in my own life. Pray for me that I may not hesitate in offering this mercy to all who have sinned against me. My Merciful Lord, You did not hesitate to forgive those who gravely sinned against You. They treated You with cruelty beyond comprehension, yet You forgave them with perfect mercy. Give me the grace I need, dear Lord, to forgive those who have sinned against me. Replace anger and hate with love and mercy.